Nexus Ruxpin? 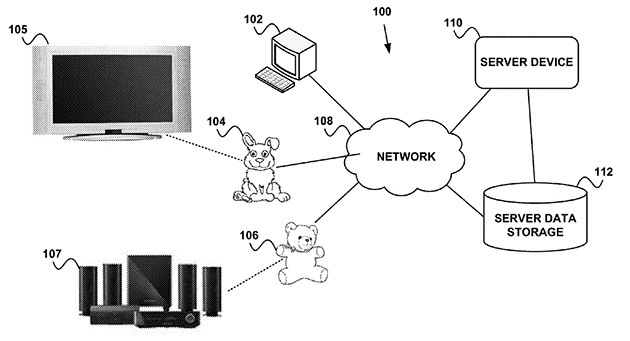 Google's mad science X division is, er, toying with the idea of smart teddy bears in one of its strangest patents yet. In response to junior's voice or movements, "the anthropomorphic device may aim its gaze at the source of the social cue," then "interpret the command (via its servers) and map it to a media control device," according to the document. From there, it could "express curiosity, (it) may tilt its head, furrow its brow, and/or scratch its head with an arm." It added that the device should be "cute" so that "young children may find (it) attractive." On top of interacting with kids, the toys could be used to control media devices like TVs, DVD players and even smart home devices like thermostats. All that may have seemed like a good idea when the patent was filed in 2012 (it was granted last Thursday), but a lot has changed since then, privacy-wise. Big Brother Watch told the BBC that "the privacy concerns are clear when devices have the capacity to record conversations and log activity... (especially) when those devices are aimed at children." The lawyer who spotted the patent put it more succinctly, saying the "creepy" idea belonged "in a horror film." On the other hand, Google could de-creep such a device by limiting its servers' access to voice commands, which it records through "OK Google" anyway. Toys like "Hello Barbie" that interact with kids are nothing new, and similar voice-activated devices, like Amazon's Echo speaker, already exist as well. Of course, all that might be moot, since Google told the BBC, "some of those ideas later mature into real products or services, some don't. Prospective product announcements should not necessarily be inferred from our patent applications."